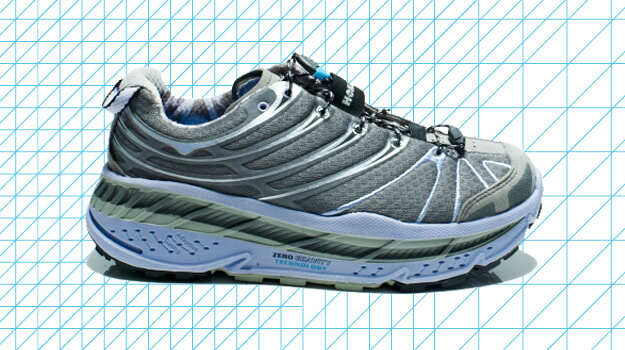 Running specialty brand Hoka One One is known for its unconventional collection of oversized running shoes, and among them is the Stinson Trail. Like the rest of the models in Hoka’s lineup, the Stinson Trail features the same stacked construction for maximum cushioning underfoot. Though there is a road version of the shoe also available, the trail edition has been modified for the precise needs of off-road running. The Stinson Trail features Hoka’s proprietary CMEVA midsole, which has basically 2.5X the volume compared to midsoles on traditional running shoes. The thickness of the midsole allows for excellent shock retention, and a surprisingly stable ride that helps reduce foot fatigue. The shoe is surprisingly lightweight given its bulky construction. It features a Meta-Rocker construction from heel-to-toe, allowing runners to roll through the gait cycle more efficiently. A highly ventilated mesh upper allows the Stinson Trail to provide maximum coverage without sacrificing breathability. Given its trail status, the Stinson is housed on a high-grade rubber outsole with multi-directional traction lugs for enhanced grip and balance on rugged terrain.